EDLI is Employee Deposit Linked Insurance scheme provided by Employee Provident Fund (EPF).EDLI is additional benefit apart from EPF-Employee Provident Fund and EPS -Employee Pension Scheme. A Majority of the employee is not aware of EDLI benefits. What is EDLI Scheme? What is maximum claim amount? How to claim EDLI Amount? Let’s try to get the answer of these questions. 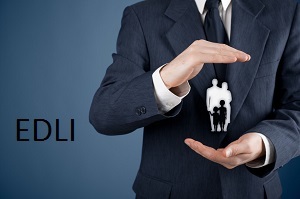 EDLI or Employee Deposit Linked Insurance is life insurance scheme. This scheme provides lump sum payment to the nominee in case of unfortunate death of EPF subscriber. All Employees who are covered under provided fund scheme and are a contributor of PF are eligible for EDLI life insurance cover. Insurance cover is variable and depends upon subscriber average balance in PF account for the past 12 months. This life insurance coverage is available for off working hours also. An Employee can be anywhere it is not mandatory that employee should be at workplace. It covers the death of employee irrespective of cause. Death can be natural or accidental. Maximum Insurance coverage limit is recently changed to 6 Lacs. The objective of EDLI is to provide income security to the PF subscriber after death. How EDLI Insurance Coverage amount is decided? The claim amount is decided based on your last drawn salary (Basic + DA). Coverage amount is 30 times of last drawn salary. The upper limit salary for EDLI is 15,000 Rs. Bonus amount for this scheme is 1.5 lac. Who Pays Premium of EDLI? Every month Employer deduct 12% of your salary (Basic + DA). This 12% is towards EPF (Employee Provident Fund). The Employer needs to contribute additional 12% from his side towards EPF. 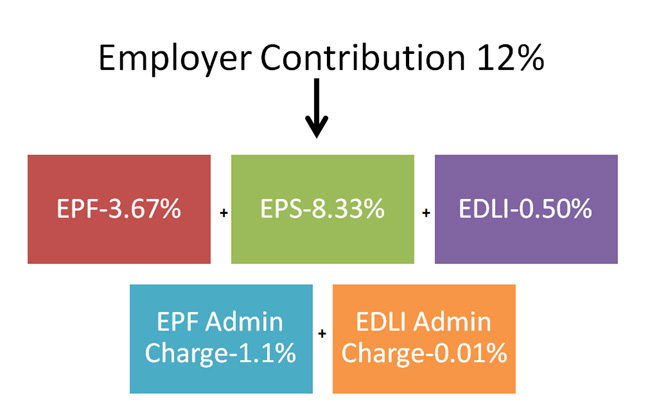 0.5% of employer contribution is towards EDLI. Contribution break up is given below. EDLI is not a mandatory option for an employer they can go for other group insurance scheme cover covering all employees. Coverage of this group insurance scheme should be equal or better than EDLI. The Employer needs to take approval of EPF office to use other group insurance scheme instead of EDLI. This type of group insurance policy is available with LIC of India, ICICI, HDFC, Max life and Bajaj Allianz. How to Claim EDLI Amount? In case of unfortunate death of PF subscriber nominee can claim the amount. If there is no nomination, legal heir can claim this amount. In order to claim EDLI, you need to use form 5 along with form 20 and form 10D/10C. Detail of bank and account number should be mentioned in this form correctly as payment is directly sent to the bank. One should attach following documents along with claim form. The First thing you need to do is find out if your employer is covering you under EDLI or not? If not what alternative is provided by your employer in lieu of EDLI? The Second thing is to find out your coverage under this scheme. It may be small insurance risk coverage but useful in planning your insurance coverage. Third is to inform to your family member about this risk coverage. Hope you like information given by me for EDLI. Don’t forget to leave your comment below, because your comment and suggestion will help me in writing better content in future. « How Life Insurance Agents are Misselling Insurance policy?